* Dit is het aanbod van Curse of the Cabal uit Time Spiral. Als een kaart in meerdere series zit kun je die apart aanklikken hierboven. Klik op de getallen om direct naar iemands collectie te gaan. De leden die het meest recent zijn ingelogd staan bovenaan. Leden die meer dan 14 dagen niet zijn ingelogd worden niet vermeld. als hij hem beurt 1 suspend dan laat je hem toch lekker resolven? vriend van me had hier een ontzettend vervelend control deck mee... suspend altijd dmv rituals e.d beurt 1 of 2 altijd zo'n ding, waardoor ik vrij snel alweer moest beginnen met saccen..
Target player sacrifices half the permanents they control, rounded down. 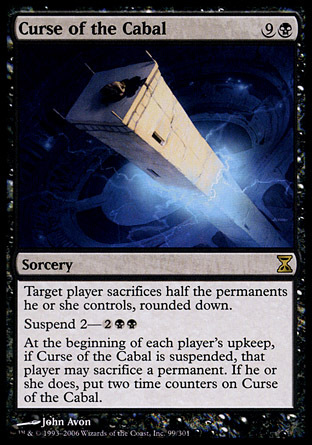 At the beginning of each player's upkeep, if Curse of the Cabal is suspended, that player may sacrifice a permanent. If the player does, put two time counters on Curse of the Cabal. You can exile a card in your hand using suspend any time you could cast that card. Consider its card type, any effect that affects when you could cast it (such as flash) and any other effects that could stop you from casting it (such as Meddling Mage’s effect) to determine if and when you can do this. Whether or not you could actually complete all steps in casting the card is irrelevant. For example, you can exile a card with suspend that has no mana cost or requires a target even if no legal targets are available at that time. Exiling a card with suspend isn’t casting that card. This action doesn’t use the stack and can’t be responded to. If the spell requires any targets, those targets are chosen when the spell is finally cast, not when it’s exiled. If the first triggered ability of suspend (the one that removes time counters) is countered, no time counter is removed. The ability will trigger again during the card’s owner’s next upkeep. When the last time counter is removed, the second triggered ability of suspend will trigger. It doesn’t matter why the last time counter was removed or what effect removed it. If the second triggered ability of suspend (the one that lets you cast the card) is countered, the card can’t be cast. It remains exiled with no time counters on it, and it’s no longer suspended. As the second triggered ability resolves, you must cast the card if able. Timing restrictions based on the card’s type are ignored. If you can’t cast the card, perhaps because there are no legal targets available, it remains exiled with no time counters on it, and it’s no longer suspended. If the spell has any mandatory additional costs, you must pay those if able. However, if an additional cost includes a mana payment, you are forced to pay that cost only if there’s enough mana in your mana pool at the time you cast the spell. You aren’t forced to activate any mana abilities, although you may do so if you wish. A creature cast using suspend will enter the battlefield with haste. It will have haste until another player gains control of it (or, in some rare cases, gains control of the creature spell itself). We hebben alle decks op de site voor je doorzocht en gekeken welke 20 kaarten het meest met Curse of the Cabal samen worden gespeeld.